The electronic cigarette industry is indeed very popular, and more and more people turn to vaping every year. However, when you choose to open your own vapor lounge franchise, you’ll be offering far more than just a place to buy ecigs, ecig parts, and eliquids. You’ll be opening a classic lounge that serves beer, wine, and champagne as well as the perfect location for enjoying high-quality eliquids without having to step outside. There are certainly plenty of manufacturers of eliquids out there, and some are better than others. If you want to be successful in any endeavor, it’s important to offer the best product available. That’s another reason why a vapor lounge is a great franchise opportunity to consider. You’ll gain access to some of the country’s best eliquids. They’re made from carefully-selected in FDA-regulated laboratories right here in the USA. In many locations across the country, the FDA has banned the use of tobacco products in public buildings and even on public property. This means that those who enjoy smoking while having a beer or a glass of wine will often end up staying at home. A vapor lounge is different in that no one is actually smoking. Only vaping is allowed inside the premises. The best part is that these lounges are decorated in a gorgeous 1940s theme, giving people the opportunity to experience something unique. According to numbers released by the Smoke-Free Alternatives Trade Association in early January 2015, the electronic cigarette industry is expected to generate some $10 billion in revenue in 2017. There are many reasons for this, but the truth is that most people believe that vaping is an alternative to traditional smoking. They often turn to ecigs to help them quit smoking, and many enjoy a great deal of success. Ecigs also offer up more variety thanks to flavors and strengths that suit unique preferences. Unlike traditional smoking, which is stigmatized in today’s day and age as a “dirty” habit, people seem to embrace the use of ecigs. 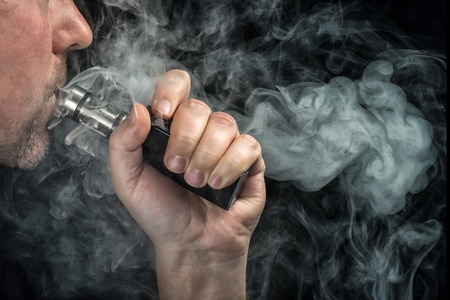 In fact, many businesses that ban smoking indoors will allow vaping in its place, except in locations where it is prohibited by local ordinances. That’s because vaping is relatively odorless and commonly viewed as safe in comparison to traditional cigarettes. If you’re looking for a franchise opportunity that offers true potential, the electronic cigarette industry is a great choice. It’s steadily growing, year after year, and it caters to a growing group of people who enjoy vaping. They view it as a more personalized alternative to traditional smoking, and a vapor lounge allows them to indulge.